Casa Quinta Penina is a 4 bedroom Premier Villa located in Alvor, part of the west Algarve, Portugal. This beautiful villa was especially built for the owner and his family and it has been furnished and equipped as a home, making it a wonderful choice for holiday rentals. Ideally suited to accommodate up to 6 adults, plus 2 teenagers or children, Casa Quinta Penina is a lovely choice of villa for families. Perfect for relaxing and unwinding during the day in the comfort and privacy of your own home, with the option of beaches, restaurants and shopping all nearby. The villa itself is at the edge of a group of villas, the pool side and the main terraces are surrounded by gardens and trees, so are not overlooked. The grounds are completely fenced and gated, and are well tended with mature shrubs and trees. The villa is well designed and built with modern amenities, including security alarm and air conditioning throughout. The villa has been furnished to a high standard, with taste and comfort in mind. Situated in the grounds of the world famous Penina golf resort, the well-known Hotel Le Meridien and the Penina Club House with three golf courses, gym and tennis courts and hotel amenities are a leisurely 15 minutes walk away. The market town of Portimao, with good shopping and fresh sardine restaurants is only an 8 minute drive away and it is the same to the resort and long sandy beach of Alvor. Praia da Rocha is an inexpensive taxi ride away for some night life and then there are several restaurants within a few minutes drive. The dining end has a table and chairs for 6-8 and a door which opens into the large modern, well equipped kitchen. This has a large "Leisure" range style cooker, a large fridge/freezer, dishwasher, microwave and even a Magi-mix and a soup beater as well as all the usual kitchen pots and pans etc. The kitchen has a bar/table top and 2 chairs suitable for kids' meals (or just watching the cook!) and a door to the barbecue terrace and another to the laundry room. The laundry room has a sink, washing machine and dryer and leads through to a shower room, as well as an outer drying terrace. Family Bedroom - This has bunk beds, which may be set as twins as they are full sized (2m long) for older children/teenagers as well as younger ones. Adults could use this room but it is furnished for children.There is a pull out mattress beneath for an extra child. Double bedroom with double bed and shower room en suite. Large double bedroom with large double bed and large full bathroom en suite (with bath tub, shower cubicle with massage column, basin, loo, heater and towel rail). All these three bedrooms have wide mirror-fronted fitted cupboards and doors to terraces. Spacious Master Suite, with double bed and wide sliding doors to the upper terrace which overlooks the pool and gardens. The large bathroom en suite has a bath tub, separate shower cubicle, double basins, loo, heater and towel rail. There is a door from this bedroom to a small terrace and steps down to the pool. Study/office. This is a light sunny room with windows on 3 sides so you can view the pool to one side and surrounding villas and gardens on the other. The lovely large blue tiled swimming pool is rectangular 15x5m is up to 1.60 deep. It has built-in gentle steps at the shallow end with a support hand rail helpful for the elderly. There are both pool lights and garden lights.The pool may have a safety fence fitted if ordered in advance. There are 8 sun-beds. The terrace from the sitting room extends along most of the pool side of the house: it is partly covered and has a canvas awning to wind out to increase the shade if necessary. The terrace is furnished with a table and 8 chairs for outside meals and other relaxing terrace furniture. There is space here to open up the table tennis table for play in the shade. To the kitchen side there is a covered barbecue area with built-in charcoal barbecue and sink. Outdoor shower supplied with both hot and cold water. There are double gates at the entrance and plenty of parking space for 2 -3 cars off the road but the garage is locked with the owners personal possessions. Paths go round the side of the villa to the pool but the property is completely fenced in. Casa Quinta Penina is opposite another of our Premier Villas,Casa Hoopoe.. This could be useful for large groups or two families wishing to holiday together, whilst having their own accommodation. Air conditioning included during peak period 26th June - 6th September. Outside this period a surcharge of £150pw applies. 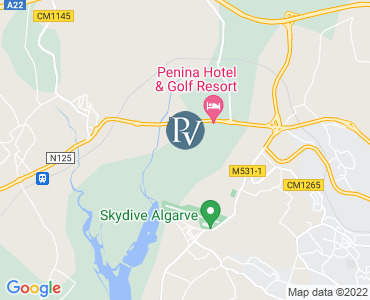 Situated in the grounds of the famous Penina championship golf course close to the 15th hole, the Le Meridien Hotel, Penina Golf Club, gym and tennis courts are only a very short distance away, payable locally.The Hotel has bars, restaurants, hairdresser and all the usual Hotel amenities. The nearest fine sandy beaches, Alvor and Tres Irmaos, are about 10 minutes drive to the East, and those of Lagos and Meia Praia about 15 minutes to the West. There is an enormous selection of restaurants within a 10 kilometre radius. Riding, lawn bowls and squash are also nearby. The busy city of Portimao, where you can enjoy the shopping facilities and restaurants is also only a five-minute drive. We have loved staying in this amazing villa. The weather has been perfect and the pool, table tennis have been regularly used. Tearing ourselves away from this peaceful haven we have visited a number of beaches around Alvor and Lagos. A drink by the estuary in Alvor before a great fish dinner - fantastic!. A week is not enough and I'm sure we will be back. Thank you Premier Villas. All prices are per week for the villa only. Villas are booked from 15.00pm on your arrival day, to 10:00am on your departure day. Please note that availability shown is subject to confirmation - please call our reservations team.